Oh Snap! The Friggin Amazing J.Ho Sketchblog...: BONUS POST: Boris the Raccoon! Now Available! BONUS POST: Boris the Raccoon! Now Available! Yesterday, in a rare excursion into the outside world, I attended the official launch party for Boris at Meltdown Comics. Vinyl Pulse has posted coverage here. Err... I mean coverage of the launch party, not of my attendence thereof. 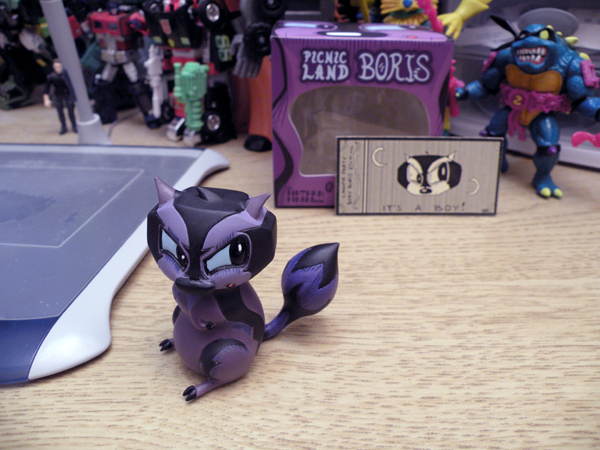 Here's a picture of the Boris that I purchased, now integrated into my menagerie of desktop toys! Also pictured: Shia Lebouf, Optimus Prime, G2 Sideswipe, Wreck-Gar, Mer-Man, Slash, and my Wacom tablet. Boris is created by Nathan Hamill, sculpted by David Kawano, and produced by U1 Toy Arts. He's available for purchase at the U1 Toy Arts website, and will be sold at Comic-Con at the Tired Girl Collective table in small press (Table M07). More Comic-Con plugs in my next post. Um...it's Sam Witwicky. Shi-bouf only played him. Uh...I mean thanks for the plug.